Last month, I was faced with a difficult decision, one that most birders would envy. Should I seek out breeding Cerulean Warblers at Sterling Forest State Park or pursue Clapper Rails and coastal sparrows with Corey at Oceanside Marine Study Area? I chose the former, gambling that the oceanside birds would be there for me later in the summer. The good news was that I found my birds and Corey found his. This past weekend, the time came to see if my gamble paid off. The Oceanside Marine Study Area in Hempstead, NY is sweet little slice of salt marsh protected from public scrutiny by a confusing warren of golf-themed suburban streets. These tidal wetlands are home to an abundance of expected long-legged waders, but also a few specialty species hot enough to draw me yet again to Long Island. First on the list was Clapper Rail, a clandestine species I’ve never had great views of. Well, five minutes at Oceanside remedied that situation. As soon as I arrived, I spotted some folks with big lenses fixated on a certain segment of tall grass. A little patience was rewarded with a rail right out in the open. It’s amazing how a bird with a bill that orange can hide so well. The rail was my primary target, but hardly my only one. This salt marsh was home to both Seaside and Saltmarsh Sharp-tailed Sparrows, neither of which I’ve seen in years. Moving away from the Clapper Rail, I noticed tons of Tree Swallows along with the expected waders, including Great Egret, Snowy Egret, and both Black-crowned and Yellow-crowned Night Herons. Laughing Gulls and Forster’s Terns were the standout larids, though far from the only ones, while the dominant raptor was definitely Osprey; a nesting pair ferried fish back to their brood of chicks. I was pleased to spot a few Fish Crow and entirely unsurprised in encountering countless Red-winged Blackbirds. I saw all of these birds, along with shorebirds like Willet and Greater Yellowlegs, but the only sparrow species I came across was, of course, Song. My strategy in these instances is similar to that I employed when I first arrived at Oceanside: look for the lenses. I came across one birder named Pete who had found Saltmarsh but still sought Seaside. When I inquired about the former, he generously led me to a spot where he had just enjoyed excellent views of these admirable Ammodramus sparrows. 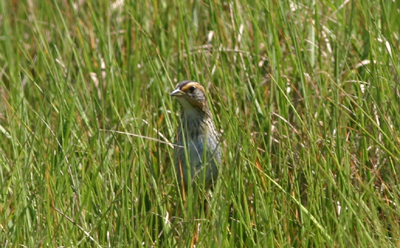 Lo and behold, it wasn’t long before we spied another Saltmarsh Sharp-tailed Sparrow creeping like a mouse through the grass, popping up every few feet to reassess the situation. For my money, this bird, with its pumpkin orange face and fine breast band, is one of our most handsome sparrows. Sad to say, Seaside Sparrow never turned up for me. Now worries there, as of the three targets, that is the one I’ve had the most experience with. Spotting the clapper and sharp-tail, on the other hand, made my day. The added bonus of visiting another new, spectacular habitat within an hour of my house didn’t hurt either! Hi Mike – That sparrow is a very interesting bird. His colors are quite attractive. I don’t think I’ll ever see one in my neck of the “woods.” Now the clapper rail – that’s a different story. 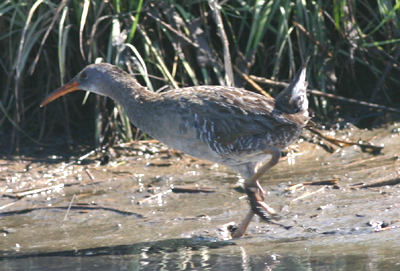 I’ve only heard a couple of clapper rails recently when I went to the Palo Alto Baylands, but I never did see them. I sure hope I get another chance at seeing one, and then I can add it to my life list. Great photos. Mary, this sparrow is an eastern US specialty, so you’ll have to come out to this neck of the woods for a shot at it. As far as clappers go, I believe you have a special subspecies in California. I’ve tried to catch a glimpse of it out in Arrowhead Marsh without success. By the way, I suspect you followed Corey here and hope you enjoy what you’ve found so far! Charlie, it looks like Mike’s been holding out on you! Charlie, I just naturally assume you’ve seen every single bird I have, except, of course, the Cerulean! Pretty cool to see the coloration differences in western vs eastern Clappers. Our eastern birds are so drab and the western birds are almost approaching King in color. Nice. Oh, dang, Patrick beat me to it. Sigh. First Snail and now Patrick and Amy… I guess I can’t resist this insidious meme any longer! Eight random facts are coming at some random point this week. Have You Ever Rescued a Drowning Peregrine Falcon?